| At Last, My Serum Has Come Around…. 19 Mar At Last, My Serum Has Come Around…. I’m always looking for ways to hydrate my parched skin. I’m like Goldilocks when it comes to moisturizer. This one is too oily. This one makes me pimply. This one burns. 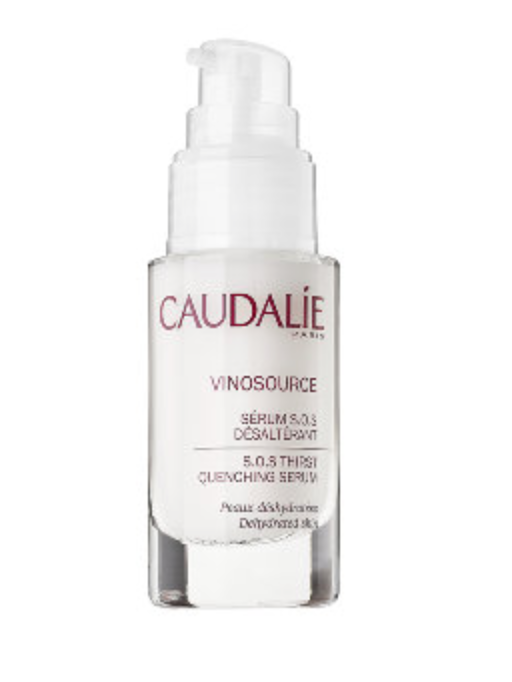 But this one, Caudalie’s Vinosource S.O.S. Thirst Quenching Serum, fits my needs just right. It’s actually designed to fit perfectly with every skin type. Apparently grape water is the secret ingredient for thirsty skin. The serum is incredibly light and silky, but replenishes the skin’s water reserves deeply. I’ve never felt my skin as soft and supple as it is when after I apply S.O.S. serum. Heck, my skin was never, ever supple before it. I haven’t had any flaky or dry patches since I started using this a month ago. If you read the reviews on this product, you’ll see I’m just one of the hundreds raving about it. It is a bit pricey, unfortunately, at $49.00. If you use three pumps a day, the bottle should last you about 6 weeks. Right now, S.O.S. serum out of stock on Sephora.com. If that’s not a good sign…Just type your zip code into the “Find In Store” box and you can find a Sephora location near you that has it in stock. love this serum! It’s been a favorite of mine for a while. It’s great in the summer since it’s so light. While I never watched The Bachelor I found your blog after reading your Cosmo article. I’m really enjoying your blog, it’s great to see good things happen for a fellow Jersey girl!